Anyone who had anything to do with Pentangle is a member of the Divine Host. This is a traditional tune, “Nottamun Town,” rendered otherworldly with Bert Jansch’s mystical guitar work. Bert uses a drop D tuning and his intricate finger picking bites out notes from his steel strings like a shower of sparks. The protagonist begins “[i]n fair Nottamun town,” seeking someone who will show him the “the way to fair Nottamun town.” He is where he wants to be and doesn’t know it. His horse stands still and throws him to the dirt. He caused his own fall, the horse could not have done it. In the end he is left sitting totally alone on “hot cold frozen stone,” with ten thousand people around him, “Ten thousand got drownded that never was born.” Indeed, a pointless life is little different than one never born. In any case, Bert Jansch’s vibratoless dry voice is a perfect vehicle for this song’s mystery. Traditional, arranged by Bert Jansch, “Nottamun Town,” Heathside Music (no date). 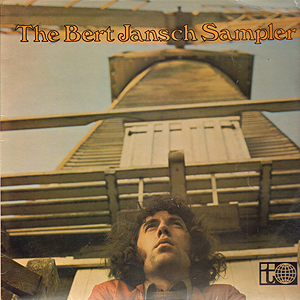 From Bert Jansch, The Bert Jansch Sampler, Transatlantic Records Ltd., Transam 10 (1969). Sleeve design – Rainbow; Photography – Peter Smith.